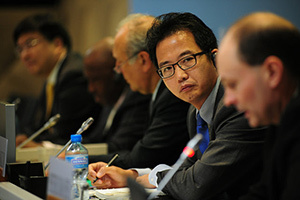 China is due for a status upgrade from the World Trade Organization (WTO). You see, when Beijing negotiated the terms that allowed China to accede to the WTO in 2001, the United States agreed to treat China as a "non-market economy" (NME) in anti-dumping cases. At least for the next 15 years, after which China would then get a WTO status upgrade to "market economy." But the United States still thinks Beijing is "dumping" its goods worldwide, thereby breaking the terms of its contract with the WTO and China. "Dumping" refers to predatory pricing applied to products left over from a trade surplus. China produces nearly half of the world's steel and has faced growing trade tension abroad as its economy has slowed and its steelmakers have stepped up exports. China claims that it hasn't sold its leftover products at lower costs, effectively hindering global competition in the steel industry. The U.S. says, "Oh yes, you have."